Cerebral oxygenation as measured by near-infrared spectroscopy (NIRS) might be useful to discriminate between physiological and pathological responses after standing up in individuals with orthostatic hypotension. This study addressed the physiological sensitivity of the cerebral oxygenation responses as measured by NIRS to different types and speeds of postural changes in healthy adults and assessed the reliability of these responses. Cerebral oxygenated hemoglobin (O2Hb), deoxygenated hemoglobin (HHb) and tissue saturation index (TSI) were measured bilaterally on the forehead of 15 healthy individuals (12 male, age range 18–27) using NIRS. Participants performed three repeats of sit to stand, and slow and rapid supine to stand movements. Responses were defined as the difference between mean, minimum and maximum O2Hb, HHb and TSI values after standing up and baseline. Test–retest, interobserver and intersensor reliabilities were addressed using intraclass correlation coefficients (ICCs). The minimum O2Hb response was most sensitive to postural changes and showed significant differences (− 4.09 µmol/L, p < 0.001) between standing up from sitting and supine position, but not between standing up at different speeds (− 0.31 µmol/L, p = 0.70). The minimum O2Hb response was the most reliable parameter (ICC > 0.6). In healthy individuals, NIRS-based cerebral oxygenation parameters are sensitive to postural change and discriminate between standing up from supine and sitting position with minimum O2Hb response as the most sensitive and reliable parameter. The results underpin the potential value for future clinical use of NIRS in individuals with orthostatic hypotension. The online version of this article ( https://doi.org/10.1007/s00421-019-04101-0) contains supplementary material, which is available to authorized users. Adequate cerebral oxygenation is essential for physical and cognitive functioning (Agbangla et al. 2017; Lotte et al. 2018; Vasta et al. 2018; Kovarova et al. 2018). Cerebral oxygenation depends on blood pressure and cerebral perfusion (Krakow et al. 2000), which are challenged by postural changes, such as standing up from supine or sitting position (Kim et al. 2011). Changes in blood pressure and cerebral perfusion after standing up are counteracted by the baroreflex and cerebral autoregulation (Xing et al. 2017; Purkayastha et al. 2018). However, these systems do not fully prevent cerebral oxygenation drops after standing up in most individuals (van Lieshout et al. 2001), which may be the cause of symptoms of dizziness, impaired physical function and falls in patients with impaired blood pressure control after standing up, i.e., orthostatic hypotension (Mehagnoul-Schipper et al. 2000; Thomas et al. 2009; Bachus et al. 2018). To discriminate between physiological and pathological cerebral oxygenation responses, physiological responses to various types and speeds of postural changes must be investigated. Near-infrared spectroscopy (NIRS) is a non-invasive and non-obtrusive method to measure cerebral oxygenation and was suggested to be valid by studies reporting the correlation of NIRS signals with fMRI BOLD signals and cerebral blood flow measured by transcranial Doppler (Smielewski et al. 1995; Huppert et al. 2006). Furthermore, NIRS is potentially useful to assess cerebral autoregulation (Steiner et al. 2009; Kainerstorfer et al. 2015). Previous studies investigated cerebral oxygenation responses using NIRS in healthy adults during head-up tilt (Houtman et al. 1999; Krakow et al. 2000; Kurihara et al. 2003), compared responses to standing up or sitting up in younger and older adults (Kawaguchi et al. 2001; Gatto et al. 2007; Edlow et al. 2010; Kim et al. 2011), compared responses to standing up with and without calf muscle tensing (Kawaguchi et al. 2001; van Lieshout et al. 2001), or determined reproducibility of responses in older adults (Mehagnoul-Schipper et al. 2001). These studies reported a cerebral oxygenation drop within 30 s after standing up. However, a comprehensive assessment of the dependence of NIRS-derived cerebral oxygenation responses on the type (i.e., standing up from supine versus sitting position) and speed of postural change (i.e., slow versus rapid standing up) is missing and the reliability of these responses has not been assessed. This aim of this study was to investigate the sensitivity of the cerebral oxygenation response as measured by NIRS to different types and speeds of postural changes in healthy adults and to assess the reliability of these responses. All data generated or analyzed during this study are included in the supplementary information file of the published article. Fifteen healthy young (mean age 22 years, SD 2.8; 12 male) individuals were recruited via oral and written advertisement in an undergraduate university teaching setting. Volunteers were excluded from participation when having a history of stroke, cardiovascular or cerebrovascular diseases, cardiac arrhythmias, cardiovascular-related medication use, diabetes mellitus or orthostatic hypotension. Exclusion criteria were checked prior to study participation by completing a short survey. All procedures performed in studies involving human participants were in accordance with the ethical standards of the institutional and/or national research committee and with the 1964 Helsinki Declaration and its later amendments or comparable ethical standards. The study was approved by the Ethics Committee of the Faculty of Science of the Radboud University in Nijmegen. Informed consent was obtained from all individual participants included in the study. NIRS signals reflecting concentration changes of cerebral oxygenated hemoglobin (O2Hb) and deoxygenated hemoglobin (HHb) and cerebral tissue saturation index (TSI) were continuously measured bilaterally on the forehead, approximately 2.5 cm above the eyebrows, using two Portalite systems (Artinis Medical Systems B.V., Elst, The Netherlands), each consisting of three light sources and one detector. The inter-optode distance (i.e., the distance between the light sources and the light detector) of the different light sources was 30, 35 and 40 mm. The sampling frequency was set at 50 Hz. O2Hb and HHb were computed using the modified Lambert–Beer law using Oxysoft (version 3.0, Artinis Medical Systems B.V., Elst, The Netherlands), calculating the differential pathway factor using the formula proposed by Scholkmann and Wolf (2013). TSI, defined as oxygenated hemoglobin as a percentage of total hemoglobin, was computed using spatially resolved spectroscopy (Suzuki et al. 1999). To identify the start of postural change, a digital goniometer was attached to the participant’s trunk to measure its angle relative to the horizontal. Time needed to stand up was defined as the time from the beginning of the first deviation from baseline to the instance where the angle was stabilized. Beat-to-beat mean arterial pressure, interbeat interval and cardiac output were measured to assess whether cerebral oxygenation responses to postural changes correspond to systemic cardiovascular responses, as these are considered to be a cause of cerebral oxygenation drops (Levine et al. 1994). Mean arterial pressure, interbeat interval and cardiac output were measured continuously using a photoplethysmograph with a cuff placed on the left middle finger (Finapres NOVA, Finapres Medical Systems BV, Enschede, The Netherlands). Peripheral oxygen saturation (SpO2) was measured to assess blood oxygenation changes during standing up. An analog reference signal containing a binary coding of time was imported in every device to enable off-line synchronization of the signals. The measurements were performed in a quiet, semi-dark room with a room temperature of 21–23 °C. Three different postural changes were performed, after demonstration of the correct task execution using a short video: (1) sit to stand, defined as standing up from sitting position at a self-chosen speed; (2) slow supine to stand, defined as standing up from supine position in approximately 10 s; (3) rapid supine to stand, defined as standing up from supine position within 3 s. Subjects were stimulated to relax, instructed not to talk and asked to move as little as possible during the experiment. The three different postural changes were performed in blocks, consisting of three repetitions per block. Each repetition encompassed a 5-min resting period (supine or sitting) and a 3-min standing period (Fig. 1). The sequence of the blocks was randomized among participants to eliminate the bias due to previous postural changes. After the three blocks, the NIRS system was reapplied by a second investigator to assess the interobserver reliability. Then the last performed postural change was repeated once. NIRS, goniometer and continuous blood pressure data were synchronized and analyzed off-line using MATLAB R2017b (MathWorks, Natick, United States). NIRS and mean arterial pressure signals were filtered using a 5-s moving average filter to reduce the artifacts. Baseline values of the signals were computed as means of the 60-s period before postural change. For visualization, all signals were normalized at baseline and signals from the left and right NIRS systems were averaged. Based on previous studies reporting an early and a late oxygenation drop, the period after standing up was divided into an early and late interval, i.e., 0–30 and 30–180 s after standing up, respectively (Thomas et al. 2009; Kim et al. 2011). Parameters expressing the mean, maximum and minimum were determined for each postural change and NIRS signal for both intervals. Signal response sensitivity for postural changes was defined as the difference between these parameters and baseline. Statistical analyses were performed using the MATLAB R2017b statistics toolbox. Response differences between postural changes were tested using paired t tests. The test–retest reliability (i.e., the agreement of responses between repeats), interobserver reliability (i.e., agreement between responses before and after reapplication of the NIRS system) and intersensor reliability (i.e., agreement between responses as measured simultaneously by the left and right NIRS system) were expressed using one-way, random, single score intraclass correlation coefficients (ICCs) (McGraw and Wong 1996) and evaluated for each signal (i.e., O2Hb, HHb and TSI), response type (i.e., mean, maximum and minimum) and interval (i.e., 0–30 s and 30–180 s). ICC scores between 0–0.40, 0.40–0.59, 0.60–0.74 and 0.75–1 were regarded as poor, fair, good and excellent, respectively (Cicchetti 1994). p values below 0.05 were considered significant. Correction for multiple comparisons was performed according to the Bonferroni method, rendering p values below 0.0009 significant. The characteristics of the included individuals are listed in Table 1. Postural changes for sit to stand, slow supine to stand and rapid supine to stand were performed in 4.3 (SD 1.1), 14.4 (SD 3.9) and 6.0 (SD 1.5) s, respectively. Figure 2 shows O2Hb, HHb, TSI and mean arterial pressure before, during and after the three types of postural change (i.e., sit to stand, slow supine to stand and rapid supine to stand), normalized at baseline and averaged over all 15 subjects. In the early interval (0–30 s), O2Hb, HHb and TSI showed a drop, which was most prominent in the O2Hb signal and in the rapid supine to stand condition. In the late interval, O2Hb and TSI showed a small decrease, while HHb showed a clear increase. None of the NIRS signals returned to baseline within the measurement period. Mean arterial pressure showed a pattern similar to O2Hb and TSI in the early interval, but remained stable in the late interval. Figure 1 in the electronic supplementary material (ESM.1) shows the cerebral oxygenation responses for the three female participants, showing similar patterns as the responses of the entire population. Mean SpO2 in the early interval did not differ significantly from baseline in any type of postural change. Interbeat interval and cardiac output showed a decrease and an increase in the early interval, respectively, for any postural change, as shown in figure ESM.2. Figure 3 shows the O2Hb, HHb and TSI signal response sensitivity to three postural changes for both intervals. As shown in Table 2, the responses differed significantly between sit to stand and both slow or rapid supine to stand, but no significantly different responses between slow and rapid supine to stand were observed. After correction for multiple comparisons, only differences in O2Hb responses remained significant, both in the early and late interval. The largest mean arterial pressure drop after standing up was 24.0 (SD 9.8), 26.4 (SD 14.6) and 29.0 (SD 7.1) mmHg for sit to stand, slow supine to stand and rapid supine to stand, respectively, being not significantly different between conditions. 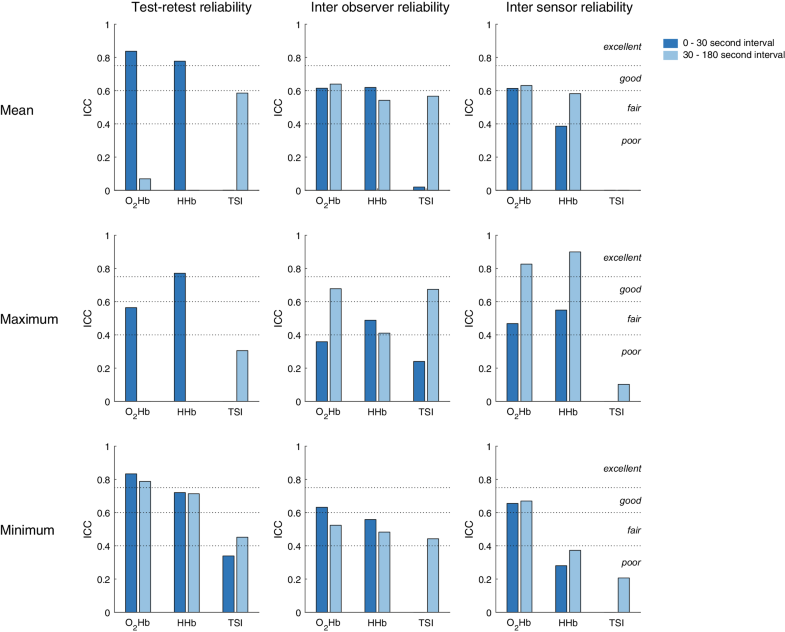 Figure 4 shows the test–retest reliability, interobserver reliability and intersensor reliability for each signal, parameter and interval. Overall, the minimum O2Hb response in the early interval resulted in the highest reliability scores, being good to excellent. None of the parameters derived from HHb and TSI had good or excellent test–retest, interobserver and intersensor reliability. Cerebral oxygenation as measured by NIRS was sensitive to postural changes in healthy adults. Oxygenated hemoglobin (O2Hb) showed the most prominent drop after standing up, which was significantly different between standing up from supine and from sitting position, but not between slow and rapid standing up. Compared to other parameters, the minimum O2Hb response in the early interval showed good to excellent reliability, identifying this as the preferred parameter in the assessment of cerebral oxygenation responses to postural changes. Both oxygenated and deoxygenated hemoglobin dropped in the early phase after standing up, indicating a lower concentration of total hemoglobin, therewith reflecting a decrease of cerebral perfusion. This is in line with the early perfusion drop after standing up reported by transcranial Doppler studies (van Lieshout et al. 2001; Thomas et al. 2009). This perfusion drop indicates that cerebral autoregulation may not immediately compensate for blood pressure drops resulting from gravitational pooling after standing up, even in healthy adults (Zhang et al. 2002; Chisholm and Anpalahan 2017; Xing et al. 2017; van Wijnen et al. 2017). The perfusion drop in the context of a constant brain oxygen demand is likely to be the cause of the cerebral hemoglobin saturation decrease, as reflected by the drop in TSI. Altered lung function during standing up may have contributed to the early drop in O2Hb and TSI after standing up. However, SpO2 did not show a significant drop after standing up, indicating this contribution was probably not large, if at all present. Furthermore, the decrease of interbeat interval and increase of cardiac output suggest a sufficient cardiac response to postural change, implying cardiac function does not account for the cerebral oxygenation drop. The late, gradual drop of O2Hb and TSI to below baseline and rise of HHb to above baseline are consistent with previous studies (Krakow et al. 2000; Mehagnoul-Schipper et al. 2001; Kim et al. 2011) and are not likely to arise from gravitational pooling, as healthy adults usually recover blood pressure within 30 s after standing up (van Wijnen et al. 2017). These may be explained by a persistently decreased brain perfusion after standing up due to persistent hydrostatic pressure differences, as reported by transcranial Doppler studies (van Lieshout et al. 2001; Kim et al. 2011). The lower brain perfusion and a constant brain oxygen demand might cause a larger part of the available hemoglobin to become deoxygenated, thereby explaining a drop of O2Hb and TSI and a rise of HHb. The significantly different O2Hb responses between standing up from sitting and supine position measured in the present study could not be explained by corresponding differences in blood pressure drop. Instead, these O2Hb response differences might be explained by dependence of cerebral autoregulation on the type of postural change, independent of the magnitude of the blood pressure drop. The vestibular system may be involved, as standing up from supine and sitting position causes different vestibular stimuli, influencing cerebral autoregulation (Serrador et al. 2009) and therewith cerebral oxygenation. 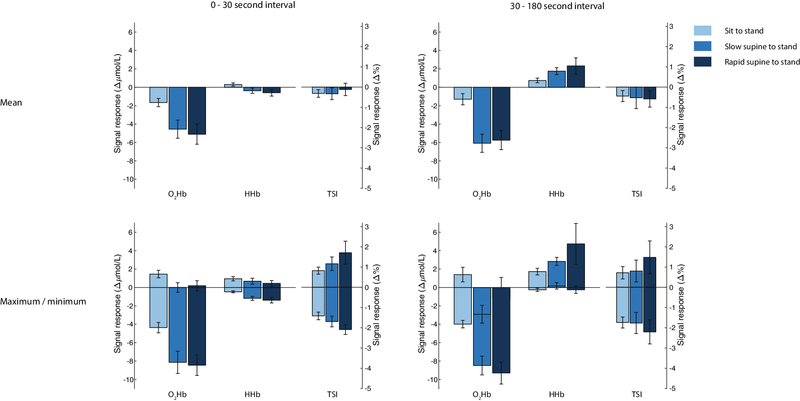 No significant differences were found between responses to rapid and slow supine to standing in the O2Hb, HHb and TSI signals, as would be expected from studies showing that cerebral autoregulation acts as a high-pass filter, implying that rapid blood pressure drops cannot be compensated for as adequately as slow blood pressure drops (Rickards and Tzeng 2014; Tarumi and Zhang 2018). 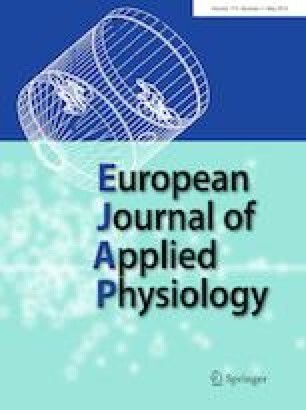 Cerebral autoregulation may not have been tested to its maximum, as measured differences of blood pressure drops between the slow and rapid supine to stand conditions in the present population were small and not significant. Further studies in patients with impaired blood pressure control, e.g., patients with orthostatic hypotension are required. 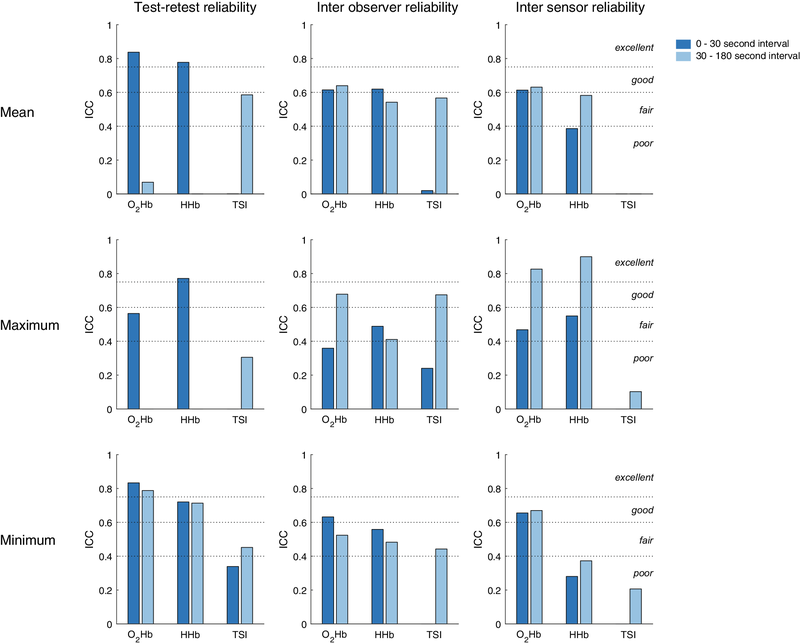 The lower overall test–retest reliability and intersensor reliability of TSI responses compared to O2Hb and HHb responses may be explained by an insufficient validity of the assumptions needed to compute TSI, such as homogeneity of brain tissue (Yoshitani et al. 2007; Murkin and Arango 2009). The substantial TSI response differences, as measured by the left and right NIRS devices, suggest different tissue properties underlying both devices, e.g., differences in skull thickness, which were reported to be considerable in a recent study (Sawosz et al. 2016). Alternatively, a relatively low sensitivity of TSI to postural changes may imply that TSI parameters are relatively sensitive to noise, leading to lower TSI reliability scores. The NIRS measurements investigated in the present study are potentially influenced by changes in scalp perfusion after standing up, which is not directly regulated by cerebral autoregulation. Studies on the contribution of scalp perfusion to cerebral oxygenation as measured by NIRS are contradictory. Cerebral oxygenation was reported to correlate significantly with jugular vein oxygenation, but not with facial vein oxygenation, suggesting signals derived from NIRS measurements primarily reflect cerebral processes (Murkin and Arango 2009). However, significant changes in TSI, as measured by NIRS, were reported after inducing scalp ischemia using a tourniquet, indicating a significant influence of scalp blood flow (Germon et al. 1994). The subjects needed more time to stand up than instructed in both the slow and rapid supine to stand conditions. This may be attributable to underestimation of the speed of standing up by the subjects. Alternatively, it may be due to the definition of the time needed to stand up, which requires a stabilized goniometer signal. If subjects stood up sufficiently rapidly, but needed some extra time to fully stabilize, this may have prolonged the measured time needed to stand up. The strength of this study is that it addresses the sensitivity of cerebral oxygenation signals for different types and speeds of postural change and systematically assesses the test–retest, interobserver and intersensor reliability for various parameters. The small number of included individuals is a limitation of this study, potentially introducing sampling error and limiting study power. The majority of the included individuals were young males, potentially limiting generalizability. Furthermore, as the experiment included only one session, no conclusions can be drawn regarding the day-to-day reproducibility of the parameters, which may be important to explain the variation of cerebral oxygenation responses in healthy adults. The results elucidate the cerebral oxygenation response to different types and speeds of postural change in healthy adults. However, they do not provide an integrative view on the cardiovascular reaction to postural change, which would contribute to the understanding of the pathophysiology of orthostatic hypotension. Future studies should address this issue, simultaneously assessing blood pressure, arterial and venous vasoreactivity, calf muscle function, sympathetic and parasympathetic function as well as cerebral oxygenation. This study does not provide results on how to predict syncope or orthostatic symptoms, as these were not recorded in this study. However, the reported results on cerebral oxygenation changes during different types and speeds of standing up in healthy adults are necessary to determine any dependence of these responses on age in future studies and to classify future NIRS measurements in patients with orthostatic hypotension as physiological or pathological. This study demonstrates that cerebral oxygenation responses measured using NIRS are sensitive to postural change and discriminate between standing up from supine and from sitting position, but not between slow and rapid standing up in healthy adults. Furthermore, it identifies minimum O2Hb response in the early interval as a sensitive and reliable parameter, suggesting this parameter to be of potential value for future clinical use in older adults with impaired blood pressure control, e.g., orthostatic hypotension. Future research should address other cardiovascular responses to postural change such as arterial and venous vasoreactivity in an integrative approach. Furthermore, it should address the effect of aging on the cerebral oxygenation response to different types and speeds of postural change, and investigate the potential of NIRS to predict clinical outcomes such as falls in patients with orthostatic hypotension. In contrast to healthy adults, the speed of standing up might be important for the cerebral oxygenation response in this group of patients due to inadequate blood pressure regulation and cerebral autoregulation, warranting further research. We thank Marc van Wanrooij from the Radboud University for providing useful comments to the manuscript. This study was supported by a grant from the Applied and Engineering Science domain (TTW) of the Netherlands Organization of Scientific Research (NWO): NeuroCIMT-Barocontrol (Grant no 14901). AM, JHHW and RJAvW conceived the presented idea and designed the study. JHHW performed the data collection. AM and JHHW performed the analysis. All authors discussed the results and contributed to the final manuscript. Willy N.J.M. Colier is Director of Artinis Medical Systems BV, which supplies NIRS measurement devices as used in this study. The authors have no other disclosures.